Even though many companies are scambling to find employees - a job fair was held in Tonawanda, Thursday, for recently laid off workers. The Tonawanda Manufacturing Job Fair was held at the Sheridan-Parkside Community Center, in the Town of Tonawanda. Tonawanda Coke closed in October. And computer maker Bak USA closed last week. Jason Miller with Fresenius Kabi, a pharmaceutical maker, on Grand Island, says the challenge is finding individuals who want to work and be productive. 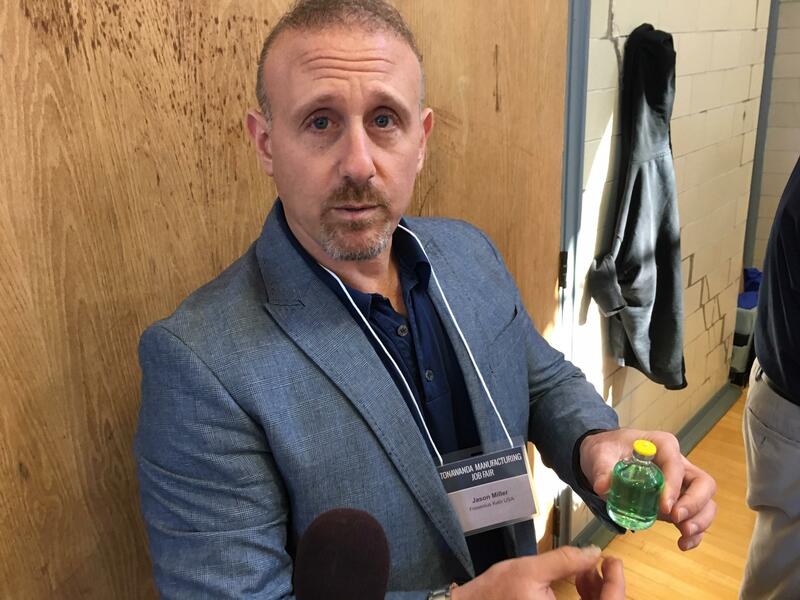 Jason Miller a Human Resources Generalist with Fresenius Kabi holds an example of the type of products the company manufactures at its facility on Grand Island. "So we want to make sure that we're finding the right individuals not just a number of individuals to come into our facility. We want to make sure that they're intelligent. That they're hard working. That they want to do a great job for us," Miller said. 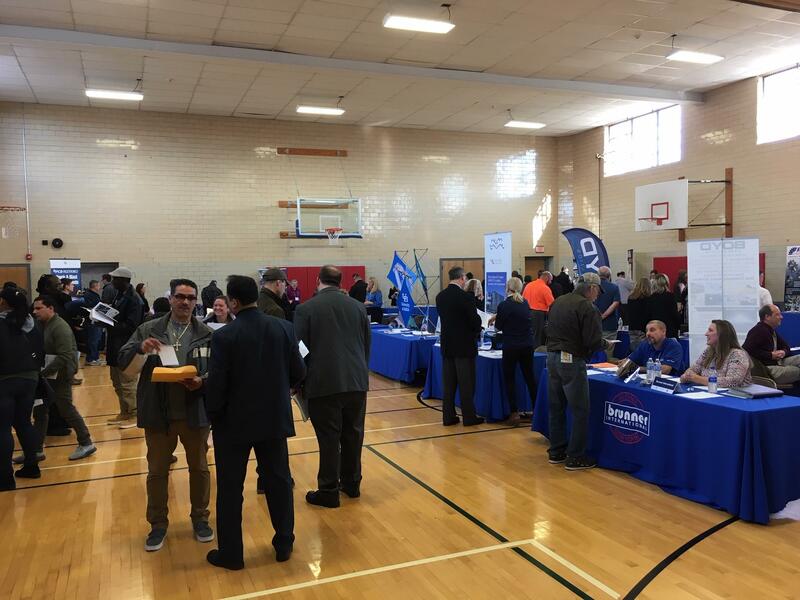 The Tonawanda Manufacturing Job Fair, at the Sheridan Parkside Community Center, attracted about 30 companies and dozens of job seekers. 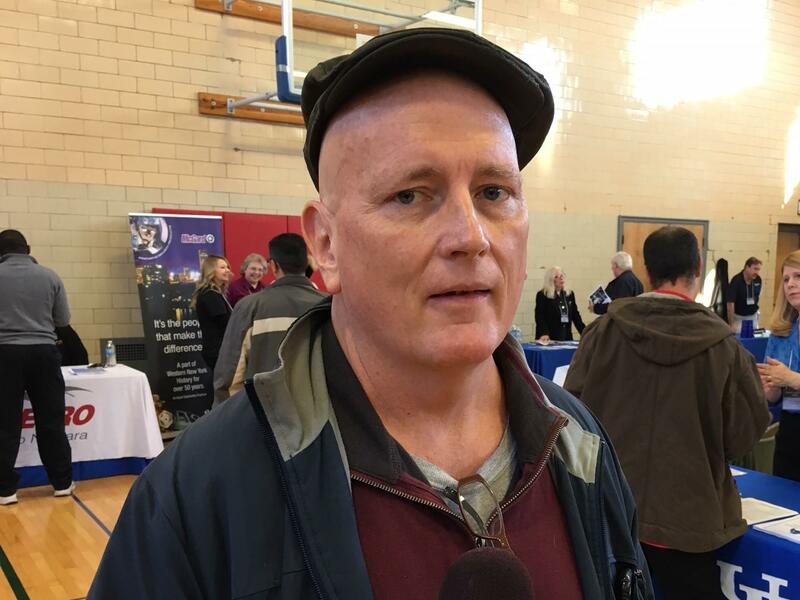 55-year-old Matthew Schimpf, a former Tonawanda Coke employee, says it's the first job fair he's ever attended. Schimpf says, he's not sure he'll find a new job at the event because all of his experience is in environmental remediation. Matthew Schimpf was among the job seekers at Thursday's event. "I'm kind of stereotyped now because I've been in a certain industry for the better part of 30 years, actually 32 years. So it's going to be a little difficult for me to try to transition into something else. It's all I've known for 30-32 years. So, we'll see. There's some interest," Schimpf said. The hiring event was organized by the New York State Department of Labor, the Buffalo and Erie County Workforce Investment Board and the Town of Tonawanda. Bak USA, a Buffalo-based tablet and computer maker, has announced it will shut down its operations, effective immediately. The company issued a statement from Chairman J.P. Bak, who said it is with "great sadness" the company will close. Visitors to the Buffalo and Erie County Naval and Military Park will have an added piece of technology to enhance their experience. WBFO’s senior reporter Eileen Buckley says Bak USA delivered 20-tablets to the downtown Naval Park at Canalside. WBFO’s senior reporter Eileen Buckley says Bak USA delivered 20-tablets to the downtown Naval Park at Canalside. Nearly three dozen teachers across Erie and Niagara counties have new Buffalo-made computers in their classrooms today, a gift from Bak USA. The downtown manufacturer donated 500 computers to the Teacher's Desk and helped give them out Wednesday.